My home page has moved, you should be redirected automatically within 5 secondes. Otherwise, please click here to get to the new page. Dieter Fox is a Professor in the Department of Computer Science & Engineering at the University of Washington. He grew up in Bonn, Germany, and received his Ph.D. in 1998 from the Computer Science Department at the University of Bonn. He joined the UW faculty in the fall of 2000. Dieter's research interests lie in artificial intelligence, robotics and probabilistic state estimation. He is the director of the UW Robotics and State Estimation Lab RSE-Lab. 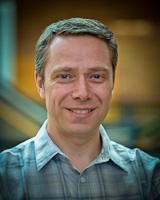 From 2009 to 2011, Dieter was director of the Intel Research Lab Seattle, and he currently serves as the academic PI of the Intel Science and Technology Center for Pervasive Computing. Check out his special consultant for Program Committee duties.